We all have weaknesses during the Holiday season. 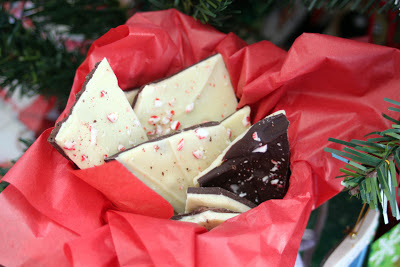 Peppermint Bark (or really anything with chocolate and peppermint) is mine! So, how do you take Peppermint Bark and make it healthier without losing flavor? Well, we have to remember more than just fat and calories when thinking of what's "healthy" at Christmas time. Yes, we could use organic chocolate, but I'm thinking of what would make this whole WORLD a little healthier. Fair Trade or "fair for life" products are not as common in regular grocery stores, but are readily available at health food stores and specialty stores. They take into consideration the people that farm and harvest the ingredients of the products. Countries that export sugars and chocolates especially tend to be linked to human rights abuses. So spending a few extra dollars for fair trade chocolate on this recipe really made me feel better about making and giving this yummy stuff as a gift this year! Whole Foods Market has a whole section of fair trade and "fair for life" chocolates. The fair trade symbol is usually a black and white emblem of someone holding a bowl in each hand. It is usually on the front of the packaging. My sister Charlotte is great about reminding us to buy as many fair trade products as possible, and baby Bodhi is rather excellent at helping with today's Easy Peasy Peppermint Bark. He loves smashing the big sheet of bark with the kitchen mallet to break it up ! Break up the dark chocolate pieces and place them in a microwave safe bowl. Microwave on high heat for 30 seconds. Remove, stir and microwave for another 30 seconds until chocolate is completely melted. Add 1 tsp. of peppermint extract to the melted chocolate and stir until combined. Spread the melted dark chocolate evenly out onto the parchment paper with a spatula. Place the cookie sheet in the freezer for 5-10 minutes, until the chocolate is set. Break up the white chocolate pieces and place them in a microwave safe bowl. Microwave on high heat for 30 seconds. Remove, stir and microwave for another 30 seconds until white chocolate is completely melted. Add 1 tsp. 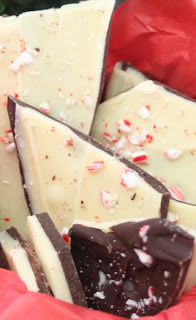 of peppermint extract to the melted white chocolate and stir until combined. Spread the melted white chocolate evenly out on top of the dark chocolate with a spatula. Sprinkle the crushed candy cane pieces on top of the white chocolate. Place the cookie sheet in the freezer again for 15-20 minutes, until the chocolate is set. Remove from the freezer and use a kitchen mallet (smooth side) to break up the large sheet of chocolate into smaller, "bark" size pieces. Try not to eat it all !